NASA's $2.6 billion rover, Curiosity, carried out a challenging landing on Mars early Monday after traveling hundreds of millions of miles through space in order to explore the Red Planet. 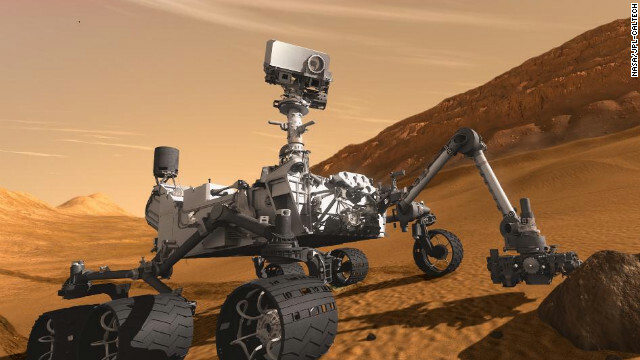 The SUV-sized Curiosity made its dramatic arrival on Martian terrain in a spectacle popularly known as the "seven minutes of terror." that mini map that they give you, if you zoom in slightly you see the 3 mountain like things.... isnt it interesting how they are lined up like the pyramids of giza over here. just a thought. Well done NASA, JPL, and all you subcontractors that made this happen. Simply amazing and forward looking engineering. For the adults of the world, this shows that America can still do it. For Kids this is just so cool...And it was "Rocket Science" that made it all possible! Applaud! Keep doing launching our Rovers to the destinations where we're getting ready until our human being lands on them!